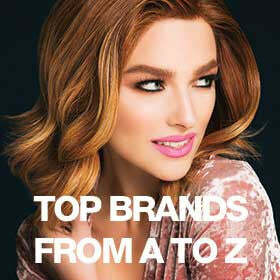 Bette by Revlon is a the perfect classic cut with layers throughout combined with a lace front cap construction. Lace Front - Delicate lace frames the face from ear-to-ear for a more natural look. Hand-tied - Tiny strands of fine hair are hand-tied around the lace for an up-close natural appearance. Flex Combs - Are located on the front, side, and back for a secure fit. We recommend using a wig comb, like the Hair Trix Comb by BeautiMark, for detangling and styling. Approximate Length: Front | Crown 2.5-9.5" | Sides 9.25" | Back 10.75" | Nape 10.75"